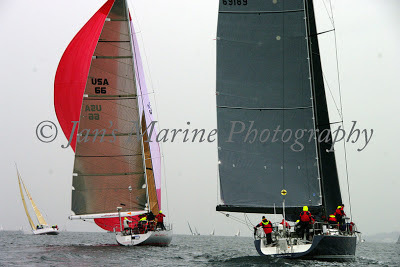 We had never buoy raced Icon before and thought we would give it a try in the 2012 Seattle Yacht Club Grand Prix. We also wanted to see how things stacked up with our "new" rating (-108) although we were pretty sure what the answer would be! Grand Prix is held in the protected waters off Shilshole Bay Marina and consists of one or more short distance races plus a number of windward/leeward buoy races. 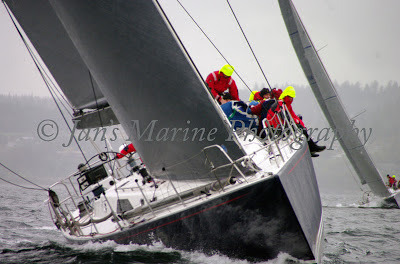 On Friday then sent us on a distance race across the channel followed by a couple of distance races. On the distance race we managed to time a few wind shifts correctly and finished relatively well for the day. On Saturday under dark skies and a freshening breeze we went around the cans. The start line was extremely short (around 20 seconds for us) so we deliberately went for very conservative starts, however being the fastest boat in the fleet we were always able to get clean air very quickly. The course legs were also relatively short so we ran two (2) A2 kites with one always in the process of being packed. Much to our surprise we were able to get around the course relatively cleanly with few mistakes. At the leeward marks we typically used a Mexican drop as it was quick and safe. Throughout the day we held our own relatively well against the other boats with the exception of FreeByrd who had straight bullets. On Sunday we had a couple more buoy races and one distance race. On the distance race we again got luckly as the wind shut off behind allowing us to extend. At the end of the regatta we finished second to FreeByrd which was to be expected given the ratings fiasco. The Seattle Yacht Club put on a great even and we will be back next year!